In A Time To Live, Robert Raines explores the spiritual and emotional dimensions of what can be the most rewarding time of life. Drawing on his experiences as an ordained minister and as director of a non-denominational retreat center focusing on issues of personal growth, Raines delineates the important passages we must all make from our middle years in the process of growing older. 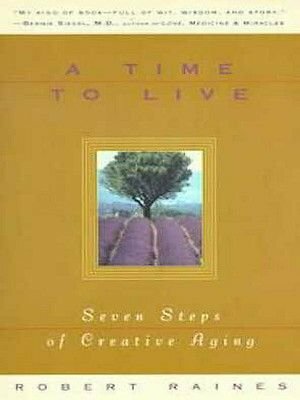 In an approach that is both meditative and inspirational, drawing from a variety of backgrounds, anecdotes, and literature, Raines provides a new perspective on the aging process and its implications. To make the most of this ultimate period of life, he argues, we must each confront certain issues: waking up to mortality, embracing sorrow, savoring blessedness, re-imagining work, nurturing intimacy, seeking forgiveness, and taking on the mysterious process of exploring what is yet to be done in life with a sense of possibility and hope.For the millions of baby boomers just entering their fifties and others approaching their sixties who are determined to be aware and take advantage of the challenges they face, A Time To Live, is the only book to directly address their needs. Sure to be a welcome and important spiritual guide for many, it offers the possibility of fulfillment and personal satisfaction.